In this cowl, I am honoring the humble Barn Owl, of the family Tytonidae, scientific name Tyto Alba. Gorgeous in coloring and patterning with striped wings reminiscent of this pattern, the Barn Owl seemed a fitting mascot for this fun and funky cowl pattern. 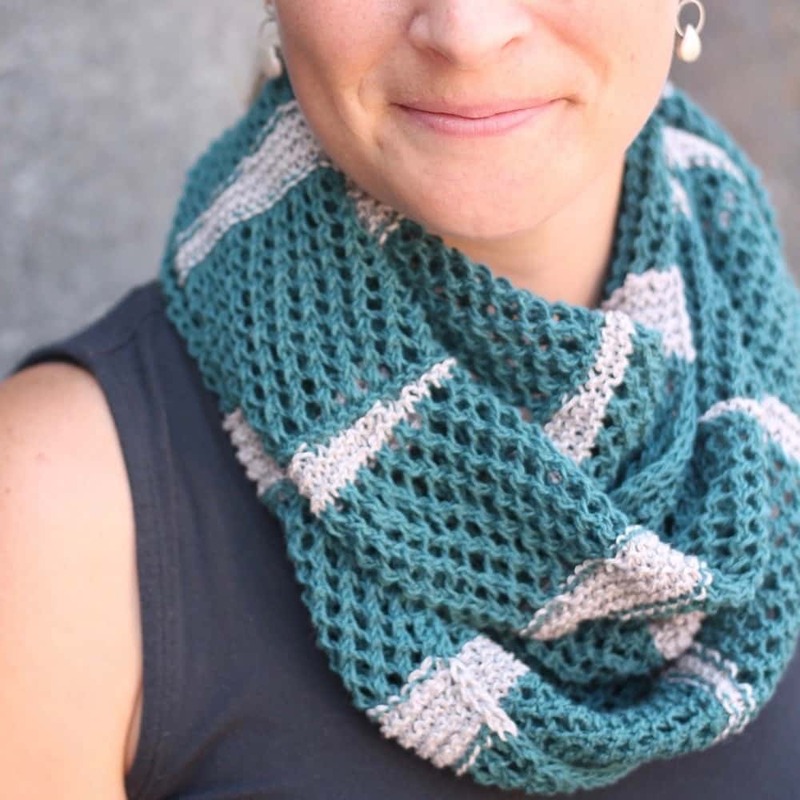 Once you get into the rhythm, you’ll soar through this cowl. Finished Measurements: Width: 8.5” tall. Length: Make as long or short as you’d like! Versions shown here: Two repeats/One loop: 32” around. Three repeats/One long loop: 48” around. Five repeats/Three loops: 80” around. Yarn: For EACH pattern repeat you need approx. 100 yards of color A & 25 yards of color B in sport or DK-weight yarn. 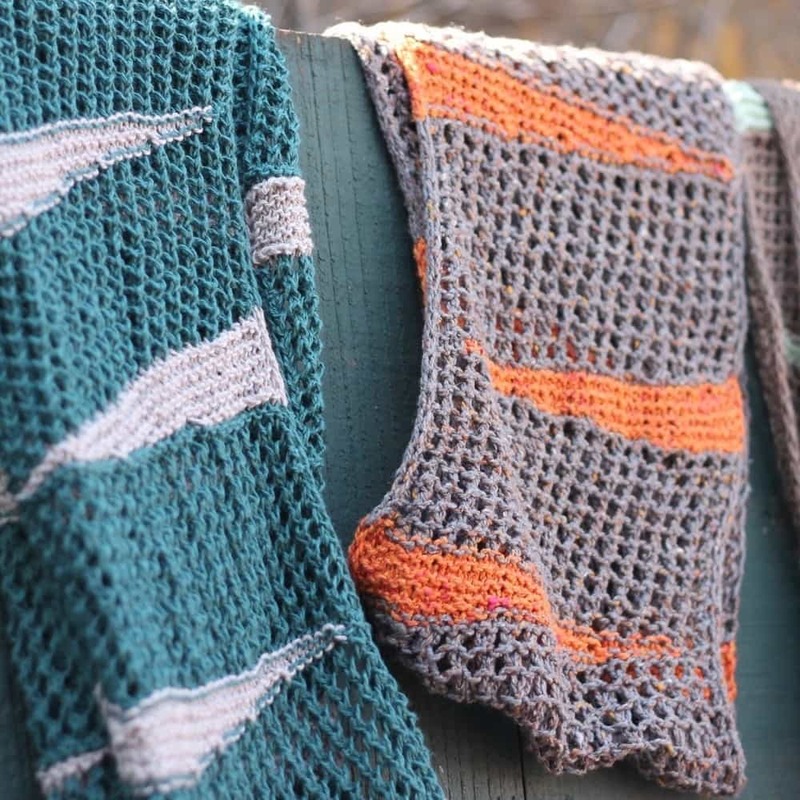 Shown in the following versions: Two repeats/One loop: Lang Seta Tweed, colorways 05 Grey (color A) & 59 Orange (color B). Three Repeats/Two loops: Louet Euroflax Sport, colorways Pewter (color A) & Seafoam Green (color B). Five Repeats/Three loops: Elsebeth Lavold Hempathy, colorways 28 Blue Pine (color A) & 34 Pale Silver (color B). Gauge: 20 sts = 4”/10 cm in stockinette stitch, measured after washing. Note: For Louet Euroflax Sport, gauge before washing will be noticeably larger: closer to 18 sts = 4 inches/10 cm.